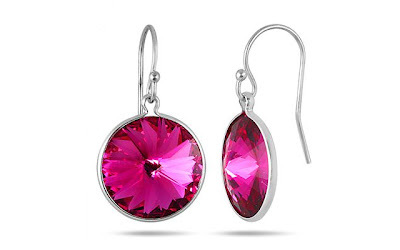 Genuine SWAROVSKI Pink Topaz Crystal Sterling Silver Earrings - Just $27 Shipped! This Genuine SWAROVSKI Pink Topaz Crystal Earrings in .925 Sterling Silver is selling now through 4/22 for just $27.00 at Szul.com! You will be saving 86% off the regular sale price of $199.00 with this jewelry deal. What I like about these Swarovski crystal earrings is the vivid pink color of the crystals and the design in the center that resembles a flower. These would make a lovely Mother's Day gift for a woman who loves to where vibrant colors.